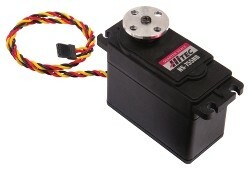 Produktinformationen "HiTec Servo mit Scheibe"
The Quarter-Scale Servo for TETRIX® offers a whopping 183 oz-in. of torque, 180-degree rotation, and superior strength and performance. Perfect for robot builds that require more power and durability. The servo features Karbonite gears that offer incredible toughness and strength. Attach this Quarter-Scale Servo to your TETRIX robot with ease with one of our Quarter-Scale Servo Mounting Brackets. Each servo includes one TETRIX Aluminum Servo Horn. Weiterführende Links zu "HiTec Servo mit Scheibe"
Weitere Info "HiTec Servo mit Scheibe"
Kundenbewertungen für "HiTec Servo mit Scheibe"